Today we learned a lot more about Route 66 at the Museum in Clinton. The road was built over a twelve year period starting in 1926 to connect Chicago to Los Angeles. As the car began to be the major mode of transportation, roads were needed. In the 30s with the depression and the dust bowl, people packed up their stuff and moved east or west. By the 50s with the Eisenhower plan that bypassed the towns with the interstates the glory days of Route 66 were all over. The guide at the museum recommended a book rather than the map set as it was written by a friend of hers and has a lot more information than the maps. (EZ66 Guide for Travelers by Jerry McClanahan). We tried it out twice on our way to Joplin. The book does make it easy to find your way. 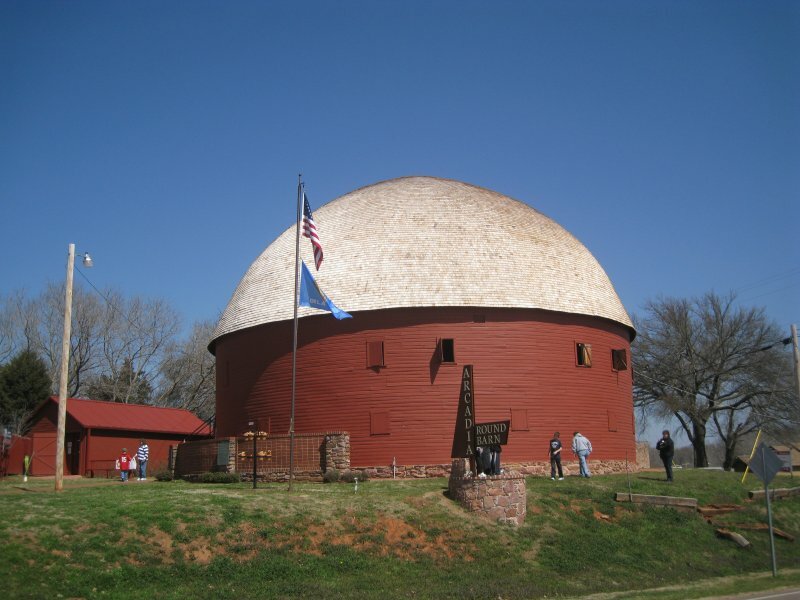 The photo shows the round barn at Arcadia, just northeast of Oklahoma City. The barn was built in 1898 and was restored in 1995. It got a new roof in 2009. It contains a gift shop and a dance hall on the second story. Route 66 covers 8 states, but only 13 miles out of over 2,000 are in Kansas. We visited this section at Galena and as result we were in 3 states, Oklahoma, Kansas, and Missouri today.